I love the look of metallic shimmer on my lips and would wear it all the time if I could. But I cannot. There are other lipsticks on this earth that nee attention too. But this one is gorgeous. Simply gorgeous. Try wearing it and tell me it's not. It goes on light and airy and dries down to a beautiful matte metallic finish. Dress your lips in an eye-catching matte metallic finish with Maybelline Lip Studio Metallic Foil Liquid Lip. It delivers a smooth matte metallic glam effect. This matte metallic liquid lipstick achieves a chromatic lip look in one lightweight swipe. Available in a range of six gilded shades from coral to purple and purple to copper and gold. To use, apply the matte metallic liquid lipstick with applicator want in the center of the upper lip and follow the contours of the mouth. You will be surprised how much color you get in one swipe. Glide the applicator across the entire bottom lip. It comes in six shades: Nemesis (metallic purple), Calypso (metallic coral), Luna (metallic pink), Trident (metallic gold), Vortex (metallic antique gold) and Zen (metallic light pink). I love that this dries to a matte finish. I love that the metallic shine is not dimmed but enhanced by the matte finish. It wears a very long time, as long as you want if not subjected to anything oily. Remove with a regular makeup wipe or makeup remover. I tried these three shades: Nemesis, Trident and Vortex. Below I am wearing Nemesis and Trident. 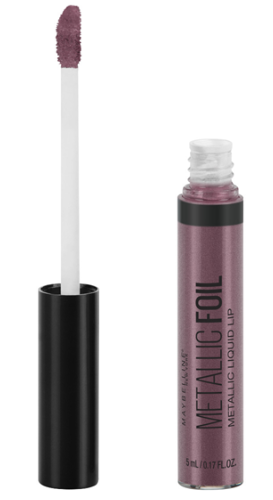 Maybelline Lip Studio Metallic Foil Liquid Lipstick retails for $8.99 and can be found at mass market retailers and at Ulta stores and www.ulta.com. Like Maybelline on Facebook: https://www.facebook.com/maybelline; Follow Maybelline on Twitter: @Maybelline; Follow Maybelline on Pinterest:http://www.pinterest.com/Maybelline/; Follow Maybelline on Instagram:http://instagram.com/maybelline# and Follow Maybelline on Tumblr:http://maybelline.tumblr.com/.